Alessandro Acquisti, a leading behavioral economist and privacy researcher. He’s a Professor of Information Technology and Public Policy at the Heinz College, Carnegie Mellon University and the PwC William W. Cooper Professor of Risk and Regulatory Innovation. Bubacarr Bah, an expert in applied and computational mathematics. He’s a Senior Researcher, designated the German Research Chair of Mathematics with specialization in Data Science, at the African Institute for Mathematical Sciences (AIMS) South Africa and an Assistant Professor in the Department of Mathematical Sciences at Stellenbosch University. De Kai, a leading researcher in natural language processing, music technology and machine learning. He’s Professor of Computer Science and Engineering at the Hong Kong University of Science and Technology, and Distinguished Research Scholar at Berkeley's International Computer Science Institute. Dyan Gibbens, an expert in industrial engineering and unmanned systems. She’s CEO of Trumbull, a Forbes Top 25 veteran-founded startup focused on automation, data and environmental resilience in energy and defense. Joanna Bryson, an expert in psychology and AI, and a longtime leader in AI ethics. She’s an Associate Professor in the Department of Computing at the University of Bath. She has consulted for a number of companies on AI, notably at LEGO researching child-oriented programming techniques for the product that became LEGO Mindstorms. Kay Coles James, a public policy expert with extensive experience working at the local, state and federal levels of government. She’s currently President of The Heritage Foundation, focusing on free enterprise, limited government, individual freedom and national defense. Luciano Floridi, a leading philosopher and expert in digital ethics. He’s Professor of Philosophy and Ethics of Information at the University of Oxford, where he directs the Digital Ethics Lab of the Oxford Internet Institute, Professorial Fellow of Exeter College and Turing Fellow and Chair of the Data Ethics Group of the Alan Turing Institute. William Joseph Burns, a foreign policy expert and diplomat. He previously served as U.S. deputy secretary of state, and retired from the U.S. Foreign Service in 2014 after a 33-year diplomatic career. He’s currently President of the Carnegie Endowment for International Peace, the oldest international affairs think tank in the United States. This inaugural Council (full bios here) will serve over the course of 2019, holding four meetings starting in April. We hope this effort will inform both our own work and the broader technology sector. In addition to encouraging members to share generalizable learnings in their ongoing activities, we plan to publish a report summarizing the discussions. Council members represent their individual perspectives, and do not speak for their institutions. We recognize that responsible development of AI is a broad area with many stakeholders. In addition to consulting with the experts on ATEAC, we’ll continue to exchange ideas and gather feedback from partners and organizations around the world. This entry was posted in Official Google Blog and tagged AI on March 26, 2019 by The Official Google Blog. 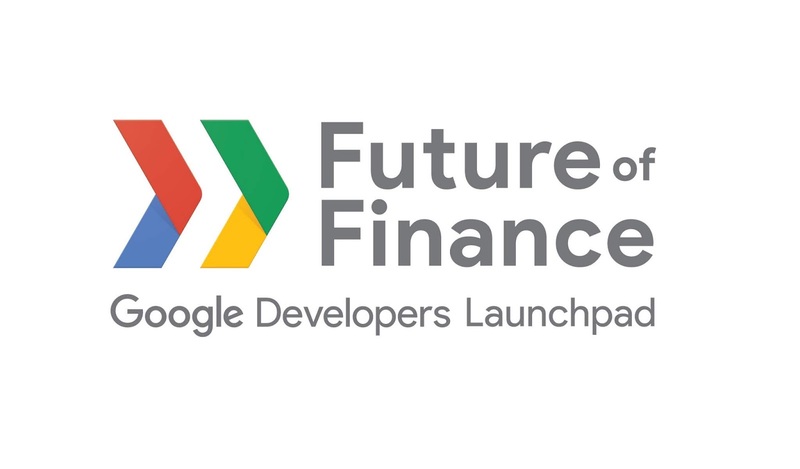 This entry was posted in Official Google Blog and tagged AI, Google News Initiative on March 21, 2019 by The Official Google Blog. Ever wondered what Johann Sebastian Bach would sound like if he rocked out? You can find out by exploring today’s AI-powered Google Doodle, which honors Bach’s birthday and legacy as one of the greatest composers of all time. A musician and composer during the Baroque period of the 18th century, Bach produced hundreds of compositions including cantatas, concertos, suites and chorales. In today’s Doodle, you can create your own melody, and through the magic of machine learning, the Doodle will harmonize your melody in Bach’s style. You can also explore inside the Doodle to see how the model Bach-ifys familiar tunes, or how your new collaboration might sound in a more modern rock style. Today’s Doodle is the result of a collaboration between the Doodle, Magenta and PAIR teams at Google. The Magenta team aims to help people make music and art using machine learning, and PAIR produces tools or experiences to make machine learning enjoyable for everyone. The first step in creating an AI-powered Doodle was building a machine learning model to power it. Machine learning is the process of teaching a computer to come up with its own answers by showing it a lot of examples, instead of giving it a set of rules to follow (as is done in traditional computer programming). Anna Huang, an AI Resident on Magenta, developed Coconet, a model that can be used in a wide range of musical tasks—such as harmonizing melodies, creating smooth transitions between disconnected fragments of music and composing from scratch (check out more of these technical details in today’s Magenta blog post). Next, we personalized the model to match Bach’s musical style. To do this, we trained Coconet on 306 of Bach’s chorale harmonizations. His chorales always have four voices: each carries their own melodic line, creating a rich harmonic progression when played together. This concise structure makes the melodic lines good training data for a machine learning model. So when you create a melody of your own on the model in the Doodle, it harmonizes that melody in Bach's specific style. Beyond the artistic and machine learning elements of the Doodle, we needed a lot of servers in order to make sure people around the world could use the Doodle. Historically, machine learning has been run on servers, which means that info is sent from a person’s computer to data centers, and then the results are sent back to the computer. Using this same approach for the Bach Doodle would have generated a lot of back-and-forth traffic. To make this work, we used PAIR’s TensorFlow.js, which allows machine learning to happen entirely within an internet browser. 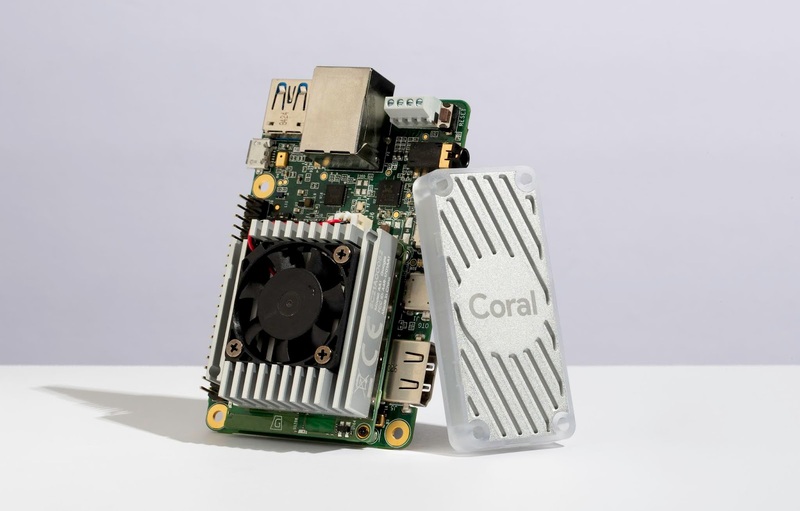 However, for cases where someone’s computer or device might not be fast enough to run the Doodle using TensorFlow.js, the machine learning model is run on Google’s new Tensor Processing Units (TPUs), a way of quickly handling machine learning tasks in data centers. Today’s Doodle is the first one ever to use TPUs in this way. Head over to today’s Doodle and find out what your collaboration with the famous composer sounds like! This entry was posted in Official Google Blog and tagged AI, doodles on March 21, 2019 by The Official Google Blog. Machine learning is already revolutionizing the way we solve problems across almost every industry and walk of life, from photo organization to cancer detection and flood prediction. But outside the tech world, most people don’t know what an algorithm is or how it works, let alone how they might start training one of their own. Parisian coder Emil Wallner wants to change that. Passionate about making machine learning easier to get into, he came up with an idea that fused his fascination with machine learning with a love of art. 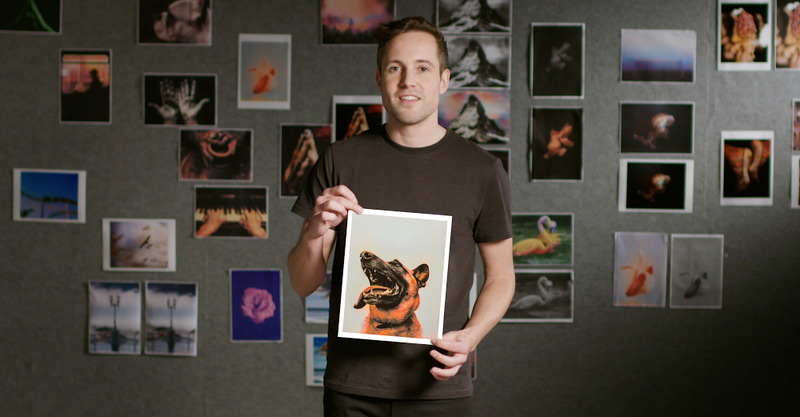 He built a simple, playful program that learns how to add color to black-and-white photos. Emil used TensorFlow, Google’s open-source machine learning platform, to build the simplest algorithm he could, forcing himself to simplify it until it was less than 100 lines of code. The algorithm is programmed to study millions of color photos and use them to learn what color the objects of the world should be. It then hunts for similar patterns in a black-and-white photo. Over time, it learns that a black-and-white object shaped like a goldfish should very likely be gold. The more distinctive the object, the easier the task. For example, bananas are easy because they’re almost always yellow and have a unique shape. Moons and planets can be more confusing because of similarities they share with each other, such as their shape and dark surroundings. In these instances, just like a child learning about the world for the first time, the algorithm needs a little more information and training. Emil’s algorithm brings the machine learning process to life in a way that makes it fun and visual. It helps us to understand what machines find easy, what they find tricky and how tweaks to the code or dataset affect results. Thousands of budding coders and artists have now downloaded Emil’s code and are using it to understand the fundamentals of machine learning, without feeling like they’re in a classroom. 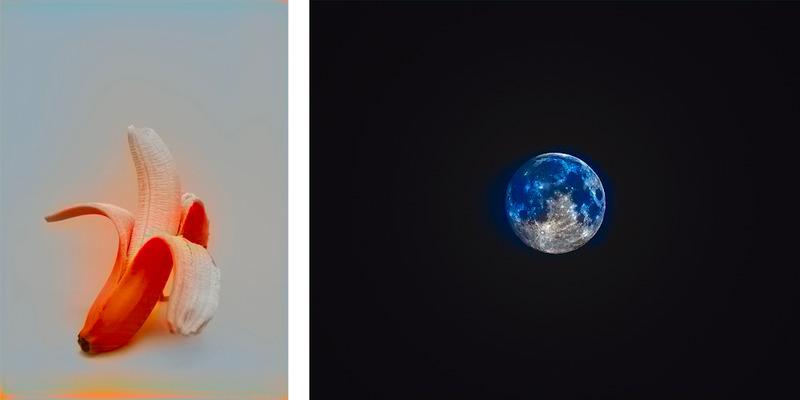 “Even the mistakes are beautiful, so it’s a satisfying algorithm to learn with,” Emil says. Black-and-white photos colorized by Emil’s algorithm. 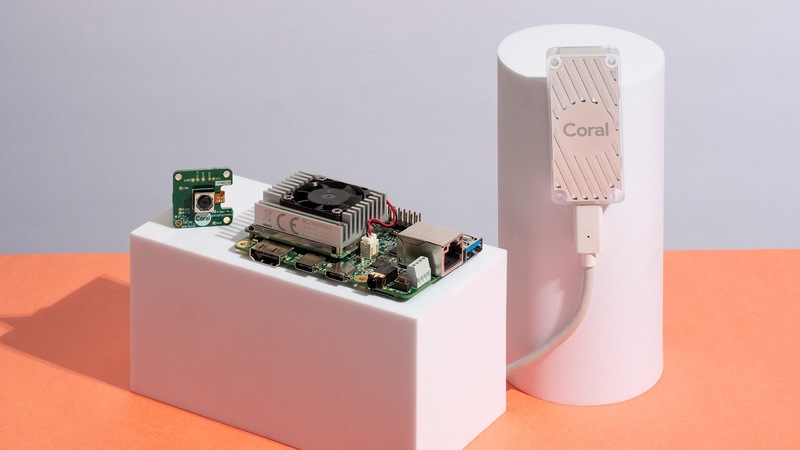 This entry was posted in Official Google Blog and tagged AI, France, Powered by TensorFlow on March 15, 2019 by The Official Google Blog. This past weekend marked Open Data Day, an annual celebration of making data freely available to everyone. Communities around the world organized events, and we’re taking a moment here at Google to share our own perspective on the importance of open data. More accessible data can meaningfully help people and organizations, and we’re doing our part by opening datasets, providing access to APIs and aggregated product data, and developing tools to make data more accessible and useful. Sharing datasets is increasingly important as more people adopt machine learning through open frameworks like TensorFlow. We’ve released over 50 open datasets for other developers and researchers to use. These include YouTube 8M, a corpus of annotated videos used externally for video understanding; the HDR+ Burst Photography dataset, which helps others experiment with the technology that powers Pixel features like Portrait Mode; and Open Images, along with the Open Images Extended dataset which increases photo diversity. Just because data is open doesn’t mean it will be useful, however. First, a dataset needs to be cleaned so that any insights developed from it are based on well-structured and accurate examples. Cleaning a large dataset is no small feat; before opening up our own, we spend hundreds of hours standardizing data and validating quality. Second, a dataset should be shared in a machine-readable format that’s easy for others to use, such as JSON rather than PDF. Finally, consider whether the dataset is representative of the intended content. Even if data is usable and representative of some situations, it may not be appropriate for every application. For instance, if a dataset contains mostly North American animal images, it may help you classify a deer, but not a giraffe. Tools like Facets can help you analyze the makeup of a dataset and evaluate the best ways to put it to use. We’re also working to build more representative datasets through interfaces like the Crowdsource application. To guide others’ use of your own dataset, consider publishing a data card which denotes authorship, composition and suggested use cases (here’s an example from our Open Images Extended release). It’s not enough to just make good data open, though--it also needs to be findable. Researchers, developers, journalists and other curious data-seekers often struggle to locate data scattered across the web’s thousands of repositories. Our Dataset Search tool helps people find data sources wherever they’re hosted, as long as the data is described in a way that search engines can locate. Since the tool launched a few months ago, we’ve seen the number of unique datasets on the platform double to 10 million, including contributions from the U.S. National Ocean and Atmospheric Administration (NOAA), National Institutes of Health (NIH), the Federal Reserve, the European Data Portal, the World Bank and government portals from every continent. What makes data useful is how easily it can be analyzed. Though there’s more open data today, data scientists spend significant time analyzing it across multiple sources. To help solve that problem, we’ve created Data Commons. It’s a knowledge graph of data sources that lets users treat various datasets of interest—regardless of source and format—as if they are all in a single local database. Anyone can contribute datasets or build applications powered by the infrastructure. For people using the platform, that means less time engineering data and more time generating insights. We’re already seeing exciting use cases of Data Commons. In one UC Berkeley data science course taught by Josh Hug and Fernando Perez, students used Census, CDC and Bureau of Labor Statistics data to correlate obesity levels across U.S. cities with other health and economic factors. Typically, that analysis would take days or weeks; using Data Commons, students were able to build high-fidelity models in less than an hour. We hope to partner with other educators and researchers—if you’re interested, reach out to collaborate@datacommons.org. There are trade-offs to opening up data, and we aim to balance various sensitivities with the potential benefits of sharing. One consideration is that broad data openness can facilitate uses that don’t align with our AI Principles. For instance, we recently made synthetic speech data available only to researchers participating in the 2019 ASVspoof Challenge, to ensure that the data can be used to develop tools to detect deepfakes, while limiting misuse. Extreme data openness can also risk exposing user or proprietary information, causing privacy breaches or threatening the security of our platforms. We allow third party developers to build on services like Maps, Gmail and more via APIs, so they can build their own products while user data is kept safe. We also publish aggregated product data like Search Trends to share information of public interest in a privacy-preserving way. While there can be benefits to using sensitive data in controlled and principled ways, like predicting medical conditions or events, it’s critical that safeguards are in place so that training machine learning models doesn’t compromise individual privacy. Emerging research provides promising new avenues to learn from sensitive data. One is Federated Learning, a technique for training global ML models without data ever leaving a person’s device, which we’ve recently made available open-source with TensorFlow Federated. Another is Differential Privacy, which can offer strong guarantees that training data details aren’t inappropriately exposed in ML models. Additionally, researchers are experimenting more and more with using small training datasets and zero-shot learning, as we demonstrated in our recent prostate cancer detection research and work on Google Translate. We hope that our efforts will help people access and learn from clean, useful, relevant and privacy-preserving open data from Google to solve the problems that matter to them. We also encourage other organizations to consider how they can contribute—whether by opening their own datasets, facilitating usability by cleaning them before release, using schema.org metadata standards to increase findability, enhancing transparency through data cards or considering trade-offs like user privacy and misuse. To everyone who has come together over the past week to celebrate open data: we look forward to seeing what you build. This entry was posted in Official Google Blog and tagged AI, Public Policy, Research on March 5, 2019 by The Official Google Blog. In the United States alone, there are 3 million people with a mobility impairment that prevents them from ever leaving their homes. Service robots that can autonomously navigate long distances can improve the independence of people with limited mobility, for example, by bringing them groceries, medicine, and packages. Research has demonstrated that deep reinforcement learning (RL) is good at mapping raw sensory input to actions, e.g. learning to grasp objects and for robot locomotion, but RL agents usually lack the understanding of large physical spaces needed to safely navigate long distances without human help and to easily adapt to new spaces. In three recent papers, “Learning Navigation Behaviors End-to-End with AutoRL,” “PRM-RL: Long-Range Robotic Navigation Tasks by Combining Reinforcement Learning and Sampling-based Planning”, and “Long-Range Indoor Navigation with PRM-RL”, we investigate easy-to-adapt robotic autonomy by combining deep RL with long-range planning. We train local planner agents to perform basic navigation behaviors, traversing short distances safely without collisions with moving obstacles. The local planners take noisy sensor observations, such as a 1D lidar that provides distances to obstacles, and output linear and angular velocities for robot control. We train the local planner in simulation with AutoRL, a method that automates the search for RL reward and neural network architecture. Despite their limited range of 10 - 15 meters, the local planners transfer well to both real robots and to new, previously unseen environments. This enables us to use them as building blocks for navigation in large spaces. We then build a roadmap, a graph where nodes are locations and edges connect the nodes only if local planners, which mimic real robots well with their noisy sensors and control, can traverse between them reliably. In our first paper, we train the local planners in small, static environments. However, training with standard deep RL algorithms, such as Deep Deterministic Policy Gradient (DDPG), poses several challenges. For example, the true objective of the local planners is to reach the goal, which represents a sparse reward. In practice, this requires researchers to spend significant time iterating and hand-tuning the rewards. Researchers must also make decisions about the neural network architecture, without clear accepted best practices. And finally, algorithms like DDPG are unstable learners and often exhibit catastrophic forgetfulness. To overcome those challenges, we automate the deep Reinforcement Learning (RL) training. AutoRL is an evolutionary automation layer around deep RL that searches for a reward and neural network architecture using large-scale hyperparameter optimization. It works in two phases, reward search and neural network architecture search. During the reward search, AutoRL trains a population of DDPG agents concurrently over several generations, each with a slightly different reward function optimizing for the local planner’s true objective: reaching the destination. At the end of the reward search phase, we select the reward that leads the agents to its destination most often. 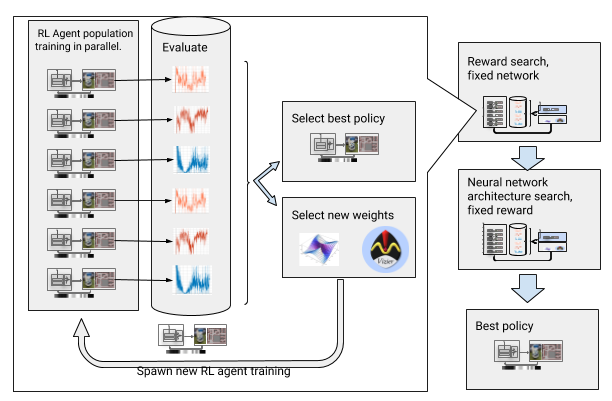 In the neural network architecture search phase, we repeat the process, this time using the selected reward and tuning the network layers, optimizing for the cumulative reward. Automating reinforcement learning with reward and neural network architecture search. However, this iterative process means AutoRL is not sample efficient. Training one agent takes 5 million samples; AutoRL training over 10 generations of 100 agents requires 5 billion samples - equivalent to 32 years of training! The benefit is that after AutoRL the manual training process is automated, and DDPG does not experience catastrophic forgetfulness. Most importantly, the resulting policies are higher quality — AutoRL policies are robust to sensor, actuator and localization noise, and generalize well to new environments. Our best policy is 26% more successful than other navigation methods across our test environments. 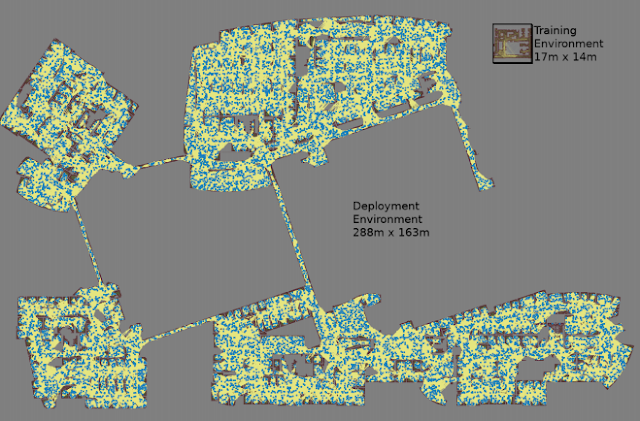 AutoRL (red) success over short distances (up to 10 meters) in several unseen buildings. Compared to hand-tuned DDPG (dark-red), artificial potential fields (light blue), dynamic window approach (blue), and behavior cloning (green). While these policies only perform local navigation, they are robust to moving obstacles and transfer well to real robots, even in unstructured environments. Though they were trained in simulation with only static obstacles, they can also handle moving objects effectively. The next step is to combine the AutoRL policies with sampling-based planning to extend their reach and enable long-range navigation. Sampling-based planners tackle long-range navigation by approximating robot motions. For example, probabilistic roadmaps (PRMs) sample robot poses and connect them with feasible transitions, creating roadmaps that capture valid movements of a robot across large spaces. 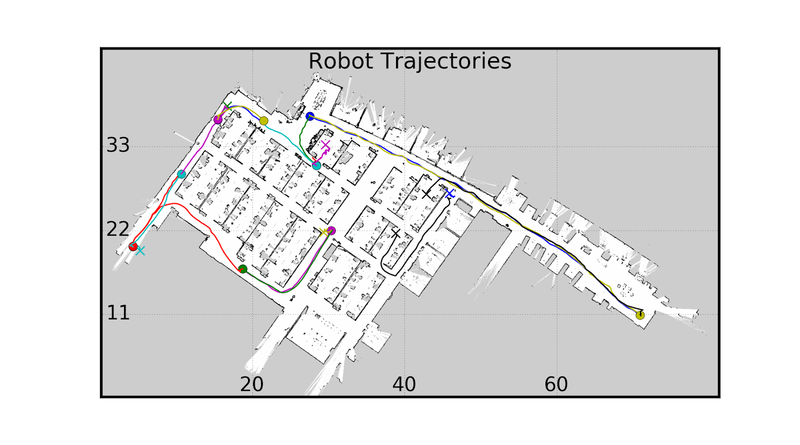 In our second paper, which won Best Paper in Service Robotics at ICRA 2018, we combine PRMs with hand-tuned RL-based local planners (without AutoRL) to train robots once locally and then adapt them to different environments. First, for each robot we train a local planner policy in a generic simulated training environment. Next, we build a PRM with respect to that policy, called a PRM-RL, over a floor plan for the deployment environment. The same floor plan can be used for any robot we wish to deploy in the building in a one time per robot+environment setup. 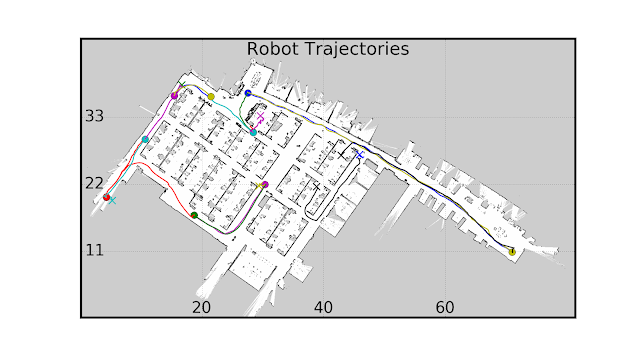 To build a PRM-RL we connect sampled nodes only if the RL-based local planner, which represents robot noise well, can reliably and consistently navigate between them. This is done via Monte Carlo simulation. The resulting roadmap is tuned to both the abilities and geometry of the particular robot. Roadmaps for robots with the same geometry but different sensors and actuators will have different connectivity. Since the agent can navigate around corners, nodes without clear line of sight can be included. Whereas nodes near walls and obstacles are less likely to be connected into the roadmap because of sensor noise. At execution time, the RL agent navigates from roadmap waypoint to waypoint. Roadmap being built with 3 Monte Carlo simulations per randomly selected node pair. The largest map was 288 meters by 163 meters and contains almost 700,000 edges, collected over 4 days using 300 workers in a cluster requiring 1.1 billion collision checks. The third paper makes several improvements over the original PRM-RL. First, we replace the hand-tuned DDPG with AutoRL-trained local planners, which results in improved long-range navigation. Second, it adds Simultaneous Localization and Mapping (SLAM) maps, which robots use at execution time, as a source for building the roadmaps. Because SLAM maps are noisy, this change closes the “sim2real gap”, a phonomena in robotics where simulation-trained agents significantly underperform when transferred to real-robots. Our simulated success rates are the same as in on-robot experiments. Last, we added distributed roadmap building, resulting in very large scale roadmaps containing up to 700,000 nodes. We evaluated the method using our AutoRL agent, building roadmaps using the floor maps of offices up to 200x larger than the training environments, accepting edges with at least 90% success over 20 trials. 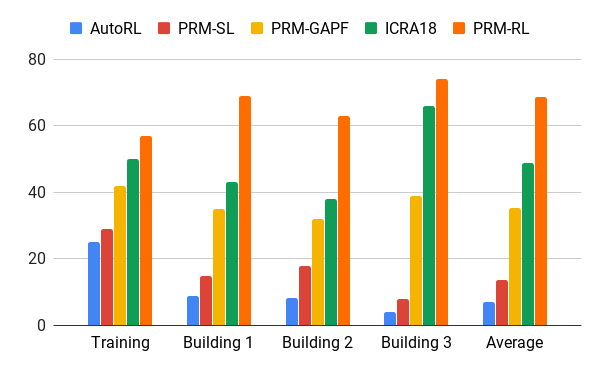 We compared PRM-RL to a variety of different methods over distances up to 100m, well beyond the local planner range. PRM-RL had 2 to 3 times the rate of success over baseline because the nodes were connected appropriately for the robot’s capabilities. Navigation over 100 meters success rates in several buildings. First paper -AutoRL local planner only (blue); original PRMs (red); path-guided artificial potential fields (yellow); second paper (green); third paper - PRMs with AutoRL (orange). We tested PRM-RL on multiple real robots and real building sites. One set of tests are shown below; the robot is very robust except near cluttered areas and off the edge of the SLAM map. Autonomous robot navigation can significantly improve independence of people with limited mobility. We can achieve this by development of easy-to-adapt robotic autonomy, including methods that can be deployed in new environments using information that it is already available. This is done by automating the learning of basic, short-range navigation behaviors with AutoRL and using these learned policies in conjunction with SLAM maps to build roadmaps. These roadmaps consist of nodes connected by edges that robots can traverse consistently. The result is a policy that once trained can be used across different environments and can produce a roadmap custom-tailored to the particular robot. The research was done by, in alphabetical order, Hao-Tien Lewis Chiang, James Davidson, Aleksandra Faust, Marek Fiser, Anthony Francis, Jasmine Hsu, J. Chase Kew, Tsang-Wei Edward Lee, Ken Oslund, Oscar Ramirez from Robotics at Google and Lydia Tapia from University of New Mexico. We thank Alexander Toshev, Brian Ichter, Chris Harris, and Vincent Vanhoucke for helpful discussions. This entry was posted in Research Blog and tagged AI, deep learning, machine learning, Research, Robotics on February 28, 2019 by Google AI Blog.